Sometimes the simple act of brushing your dog can be a challenge. 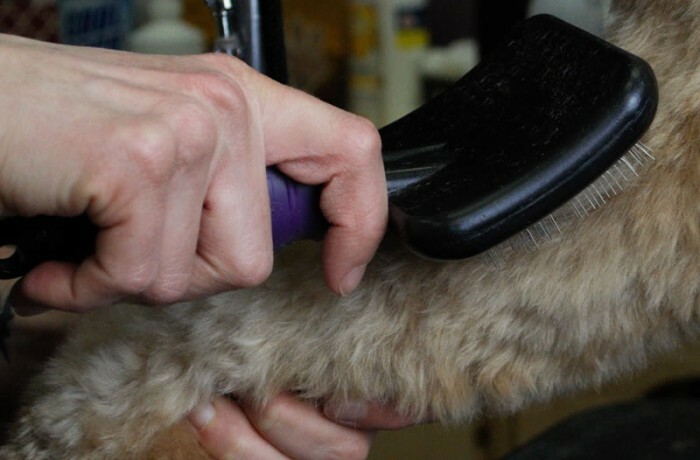 Teaching your dog to readily accept grooming at home can be invaluable. Wouldn't it be great if your dog really enjoyed being brushed at home? This is an easily attainable goal, with a little bit of forethought and patience. First, evaluate where you are presently at with your dogs feelings and behavior with being handled. Are there certain parts of her body that are untouchable? Does your dog run when you get out the brush? If the tool itself causes your dog unease, then that is where to start. Obtain some very high value treats, something special, like left over chicken cut in very small pieces. Bring out the brush and once the dog sees it give her a treat. Do this many times a day and go no further with the brush. Once the dog is showing a happy response to the brush, and only then, it is time to move on. This might seem like a tedious process, but it will actually go fairly quickly, if you remember to take a few seconds throughout your day. Once the dog is happy to see the brush, it is time to start with some brushing. Where to start? Let's say the dog is not comfortable with having it's front legs brushed. That is not where you will start, but the opposite. Start brushing where the dog is most accepting and slowly work your way toward the problem areas. Avoid the temptation to move too quickly. Take your time and reward you dog with praise and/or treats.